We are having way too much fun with this baby girl. One thing I just love is baby photos. Somewhere along the line I got it in my head that I could do this myself. I even tried with my sister’s kids when they were babies. I remember her loving it until I tried to stuff her son into some pocket precariously attached to the crib! But that didn’t stop me from trying shots with our little Eliana!! It’s pretty easy to move and play around with a full and sleepy baby. But taking photos, good photos, that is another story. We attempted to do so her first week of life. The first time we tried I thought it would be a good idea right after she ate-while she was in her milk coma. Well, turns out that is also the time that she poo’s everything out she just ate! 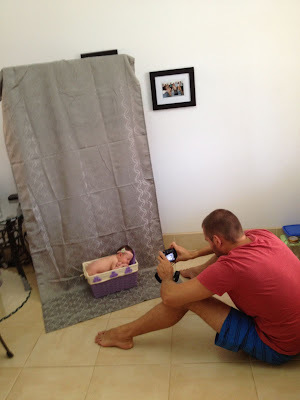 So I got her good and naked, Brandon was standing by skeptical of a full and diaper-less baby…I set her down on the backdrop-the beautiful quilt my aunt Karen made for her-and wouldn’t ya know it? She smiles at us, I whip out the camera, and she poo’s all over the quilt. Round two. We decide to feed her, then wait about an hour after she is sleeping and gently move her into position. This works much better, and we had so much fun getting some fun shots of her. I was the baby mover/manipulator and Brandon took a million shots of her. For as many as we took, not too many came out great. These professional photographers sure know what they are doing, no wonder they charge a lot!! So here are a few that turned out! This one is my favorite! And my sweet friend Alisia made that cute hat!! A girlfriend here, Summer, made this cute headband for her! We made our own little back drop too-Brandon hard at work! Remember, grandparents, great-grandparents, parents, friends and anyone else you know can never get enough pictures of darling little Eliana. Keep em coming !!! Jess & Brandon, She is so pretty. I know you are really enjoying her. They change so fast. You did a great job on the pictures. She has a lot of hair. Wish we could see & hold her for awhile. Love to all of you. She is so yummy…who needs clothes when you have such darling head wraps! Keep those photos coming, we sure love them!! What a precious little doll !! We know that you are in “seventh heaven” right now…….so keep right one enjoying your gift from the Lord !! Brandon and Jess – She is absolutely adorable. Want to see her in person. Enjoy. Love to you all. Next Next post: My mom here for a visit!